What storm is this? The horrific blizzard that hit New York on February 17, 1902. 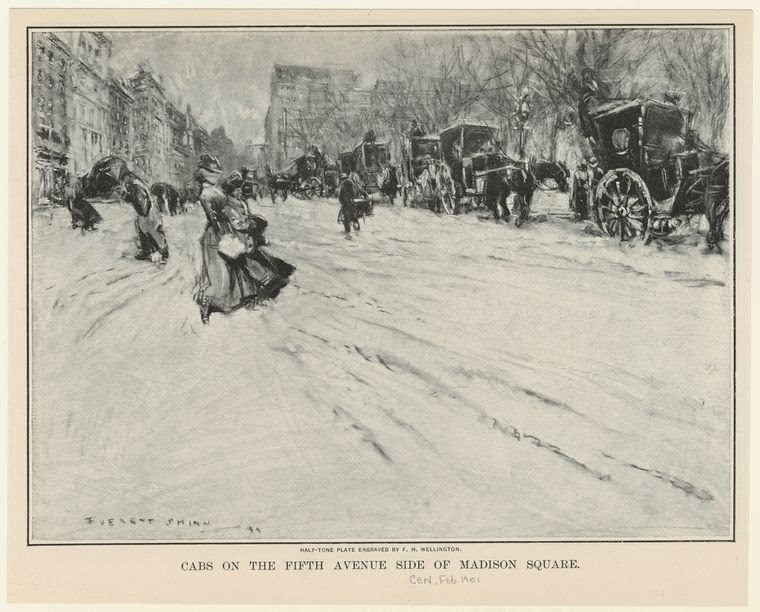 It would be considered the worst snowstorm to hit the metropolitan area since the Great Blizzard of 1888. (Read all about it here.) I assume we’re actually in the aftermath of the blizzard here, as the snow shovels are out, and the kids are playing. Who made this? Edison Manufacturing Company. Their Manhattan studio was nearby, at 41 East 21st Street. Who’s the director? The head of Edison’s film division Edwin S. Porter, considered by most to be the first real movie director, inventing basic techniques used by subsequent filmmakers. What are we seeing? Trolleys, cabs, carriages and other unusual vehicles, braving the icy conditions and dodging pedestrians at the intersection of Broadway, Fifth Avenue and 23rd Street. At one point, you almost see a team of horses slide off the road! 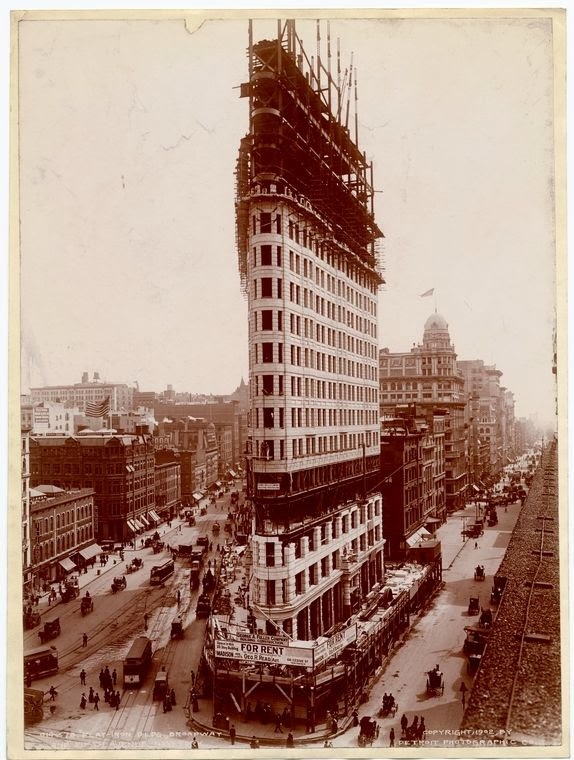 Why aren’t they showing the Flatiron Building? It’s not completed yet! The Daniel Burnham-designed office building would be opened by the summer, to great fanfare. But as an open construction site, it would have been dangerous to linger anywhere around it. I believe the slanted beams you see at the very end are part of the construction site. This is the first film of a New York blizzard? This is probably the first film of any American blizzard. Primitive film technology had only recently allowed for outdoor filming. Porter and his crew would have been brave indeed dragging Edison’s equipment even two blocks through these conditions. What’s that big building at the end? The Fifth Avenue Hotel, once considered the greatest accommodation in New York City and a headquarters for backroom politics in the 1870s and 1880s. Its glory days are long passed by the time of the blizzard. Six years later, it would be torn down and replaced with the building that stands at that corner today — the International Toy Center. As the camera pans around, you can see the Fifth Avenue Hotel street clock, a replica of which still sits in that very spot. Is this the first movie ever filmed in Madison Square? No. That distinction goes to a boxing match filmed seven years earlier at the top of Madison Square Garden between ‘Battling’ Charles Barnett and Young Griffo.